PARIS, France, February 19, 2013 (ENS) – PSA Peugeot-Citroën has developed a unique hybrid car powered by gasoline and compressed air called Hybrid Air that will debut in Geneva next month aboard a Citroen C3. 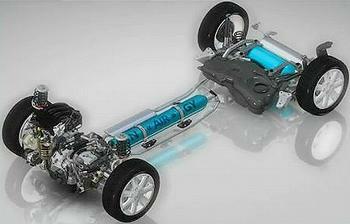 The new hybrid uses compressed air for energy storage instead of a battery, making it lighter weight and more affordable than other types of hybrid vehicles. The Hybrid Air system combines a compressed air energy storage unit located in the center of the floor, a hydraulic pump/motor unit and an automatic transmission with an epicyclic geartrain and couples it with a PureTech petrol engine. The automaker says the compressed air can power the car up to 80 percent of the time and a Hybrid Air vehicle will be able to run emission free in the city. The technology was developed in partnership with the French government and with strategic partners Robert Bosch and Faurecia. Eighty patents were filed by the PSA Peugeot-Citroën Group during development. The technology could possibly be incorporated into vehicles made by General Motors as part of an alliance agreement with PSA finalized in February 2012. He said the Hybrid Air can go 100 kilometers (60 miles) on 2.9 liters of gasoline, saying it represents a key step towards the goal of developing a vehicle by 2020 that will travel 100 km on just two liters of fuel. PSA Peugeot-Citroën leads the electric vehicle market in France and ranks second in Europe as a whole, with more than 6,500 Peugeot iOns and Citroën C-Zeros sold in 2012. Light commercial vehicles will be added to the EV line-up in 2013. On February 4, PSA Peugeot-Citroën received the Ecobest 2012 award for marketing a wide range of technologies designed to improve the environmental performance of its vehicles. Christian Chapelle, vice president powertrain and chassis engineering, received the award from a jury of automotive journalists from 15 countries in Central and Eastern Europe, in the presence of Greek Minister for Transport and Infrastructures Kostís Hadjidákis. The jury saluted the Group’s world premiere launch of HYbrid4 diesel hybrid technology as well as its marketing of micro-hybrid solutions. Each year, PSA Peugeot-Citroën allocates funds to reducing the CO2 emissions of its vehicles, with the goal of offering a clean car for every type of use. Advances in powertrain technology, combined with work to reduce vehicle weight and improve aerodynamic performance, have made it possible for PSA to lower its corporate average CO2 emissions to 122.5 grams per kilometer, meeting the European Commission’s 2015 target four years early. 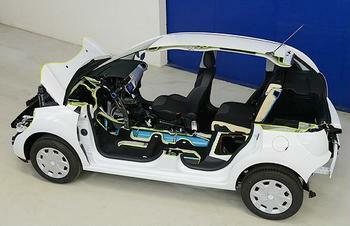 The Hybrid Air car will be shown at the Geneva International Motor Show, which opens to the public March 7. In Geneva, fully 10 percent of the models on display will be clean cars.